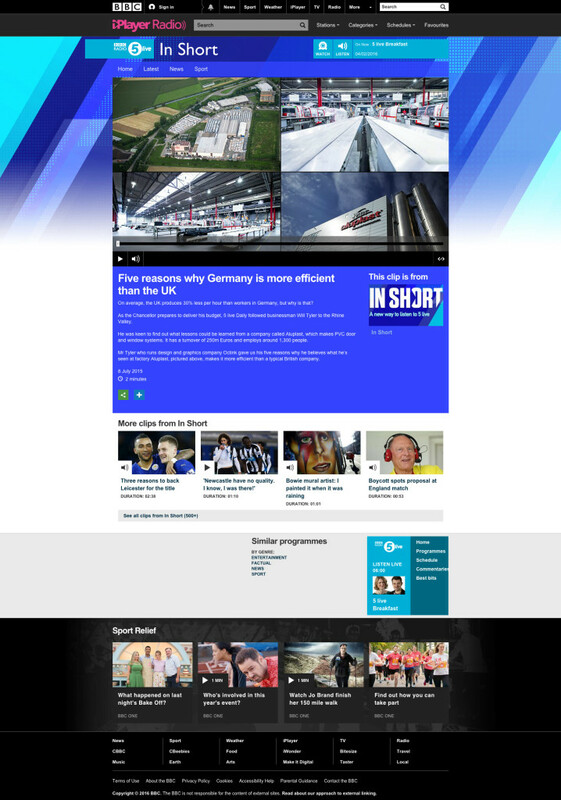 Broadcast live from Karlsruhe, Southern Germany earlier this year, presenter Fiona Trott and the British businessman Will Tyler reported on how continuing investment had supported the systems company’s increased productivity. Speaking on the ‘In Short’ show, Tyler said that education, staff engagement, long term planning, research and ultimately investment, are driving increased outputs and technical innovation. He said: “The educational input into that factory was unbelievable. I have never seen anything like it in the UK. There was incredibly good communication between senior management and staff to the point that when the MD of this €250m business walked around the floor no one seemed surprised or overly impressed. “That stemmed from the fact that the company had a very long term strategy. Companies talk about five or 10-year plans but I saw it in its truest form today. Lots of different departments were working on lots of different things but all aimed at delivering improvements and each activity was bearing fruit. Processing more than 150,000 tonnes of PVC-U annually, equivalent to 75 per cent of the whole UK and Irish markets combined and with its customer base manufacturing more than 10million windows per year, aluplast remains a global leader in window system technology. The company’s core range in the UK is built around the Ideal 70 system. This draws down on aluplast’s investment to offer one of the industry’s most energy efficient five chamber PVC-U systems. Keith White, Managing Director of aluplast’s in the UK, said: “The fact that aluplast German operation is being held up as an example of innovation, productivity and efficiency is an indication of the resourcing and expertise, which sits behind its operation and offer, here in the UK. “It’s continued and continues to invest and to drive forward market leading innovation. In the Ideal 70 we are able to offer UK fabricators access to a leading global systems but at an exceptionally competitive, high value price point.